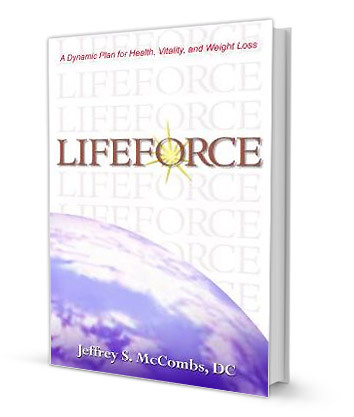 LifeForce by Chiropractor Jeffrey S. McCombs outlines a simple and effective approach to preventing and overcoming disease, illness, and other health concerns that has been used by many of the author’s patients. The LifeForce Plan is a potent tool for detoxifying the body, reestablishing the normal flora of the tissues, and reawakening the body’s innate ability to regulate, balance, and protect itself. It teaches us how to activate the endless life-force potential that resides in every cell of our bodies. The seemingly miraculous results are achieved through a time-proven approach to reversing the ravaging effects that antibiotics have had on our bodies. Though antibiotics are useful, it is their worldwide overuse, misuse, and general application that have produced a devastating imbalance. The LifeForce Plan reverses that imbalance and restores the regenerative, life-enhancing cycle of the body, as the dominant cycle over the degenerative, aging cycle. The Plan succeeds where other anti-Candida diets have continuously failed, due to key fundamental insights, and it also provides a way to balance the effects of antibiotics when their judicious use is necessary. This is not intended to be a typical diet book. It offers a way to achieve better biofeedback from the body that will enable you to make dietary choices that will work for you. The Plan is a bridge back to an optimal state of health for our bodies.